The Gene Kranz was a pick up for my Oddball collection. Growing up in the Clear Lake City area where NASA was situated and being mesmerized by the space program growing up, I've always had a lot of respect for Gene Kranz. He was a leader and had a great influence on the space program as the Flight Director through the Mercury, Gemini and Apollo programs. In Apollo 13 he is played by Ed Harris. Know for his flat top and keen dress, Kranz will always be well remembered among NASA enthusiasts! I withhold the traders name since he's not a blog reader. I'm being nice, I do believe deep down that he may have been trying to pull one over on me (I heard from others he had done the same to them) and I really think that if I hadn't made a big deal out of it, he'd have held on to these and blamed USPS. Anyways, on to more interesting topics... CARDS! Finally, I got a prize package from Brian from Play at The Plate... he's had a bit of a rough go at it of late, so I'm hoping he's able to take some encouragement and get things going in a good direction. 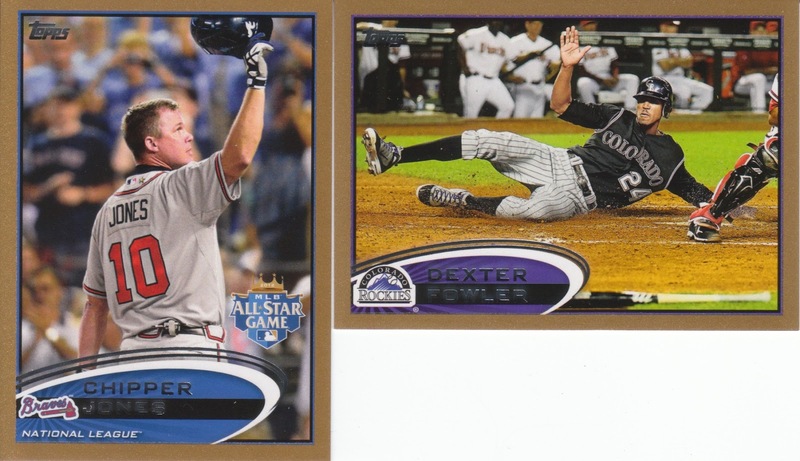 I won a contest in September that netted me a rack pack of 2012 Topps Update... there wasn't much exciting inside but I did get two parallel gold cards numbered /2012. The Chipper will go to David from the package above as part of the return package, and how appropriate is the "play at the plate" card in a package from Mr. Play At The Plate himself!?!?! Thank Brian! Did your Bowman Chrome auto I sent you ever show up? nice staub! i met gene kranz at an angel game once. it was cool to shake his hand although my brother was the bigger space geek. seeing packages arrive from dayf and patp gives me hope that i too might see a trade return package from them. i will send your cards out this weekend to complete our trade. I've had a couple of weird non-deals since I returned to my blog. I sent one package in December after seeing he traded with a very popular blogger. 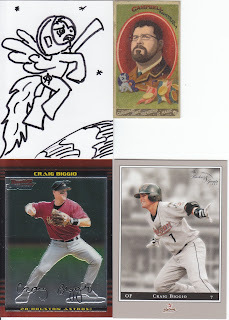 The guy - new blogger - got the cards, which I gathered from various sets after checking his wants for some two hours. He didn't respond for a couple of weeks so I wrote him to make sure. Yes, he got them and thanks. He then said he hasn't had time or funds to mail the 20 or so cards he promised me. No word for several weeks. Frustrating. Sweet Kranz! I'm a big fan of anything NASA, naturally, since that's where I work. I would actively collect NASA stuff, but there's just too much of it out there. Glad to see everything eventually worked out with that trader. Unfortunately, sometimes we're too trusting of people and can get burned. Don't let it discourage you too much. Sorry I missed this one Sam. Nice gold patp! February Group Break - Sign-Ups Are FULL!!! Packages! I love Monday Mail Days!! !